This is after the oldest Tulfo brothers had experienced 'arrogant' staff in PGH where his driver accidentally bumped a 6-year-old girl in Navotas on August 16. In a Facebook post last Saturday, August 25, the columnist and broadcaster Ramon Tulfo asked the public most especially his followers on social media to secretly record their experience at Philippine General Hospital (PGH) and other government hospitals with non- accomodating staffs. "Mga kababayan ko, kunan n'yo ng video ang mga doktor ng PGH at iba pang gov't hospitals na arogante at hindi nag-aasikaso ng mga pasyente. 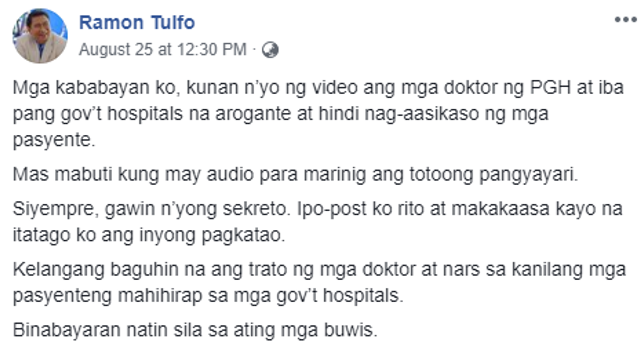 Mas mabuti kung may audio para marinig ang totoong pangyayari," Tulfo said in his post against government doctors. "Siyempre, gawin n'yong sekreto. Ipo-post ko rito at makakaasa kayo na itatago ko ang inyong pagkatao," he added. Just last week, Tulfo has posted a video of his "PGH experience" which had gone viral and has already 910,000 views as of writing, where he was heard shouting at the doctors of the emergency room demanding immediate attention to the 6-year-old girl his driver accidentally bumped in Manila. 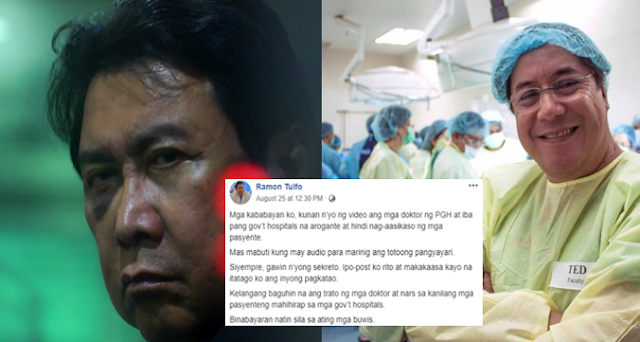 PGH has since demanded an apology from Tulfo over his "unacceptable and unbecoming" behavior which could have endangered the lives of patients in the emergency room. But Tulfo has so far refused to apologize to PGH. "Kelangang baguhin na ang trato ng mga doktor at nars sa kanilang mga pasyenteng mahihirap sa mga gov't hospitals. Binabayaran natin sila sa ating mga buwis," Tulfo said in his latest post, which he also posted on Twitter. Meanwhile, since Philippine General Hospital is a tertiary state-owned hospital administered and operated by the University of the Philippines (UP) Manila,University of the Philippines Executive Vice President Teodoro Herbosa says what Ramon Tulfo wants his followers to do would be against several laws in the Philippines. 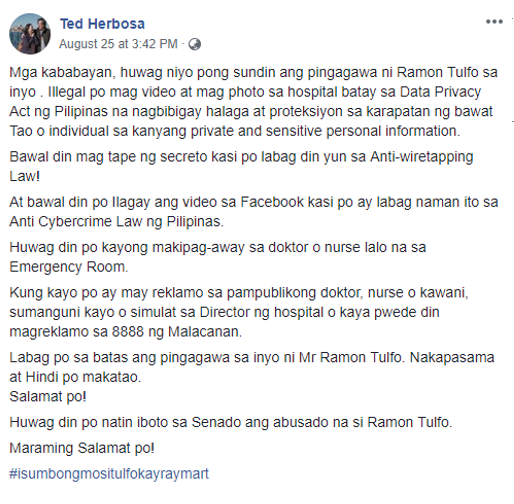 Former health undersecretary and UP Executive Vice President Teodoro Herbosa said what Tulfo is asking his followers to do would be in violation of the Data Privacy Act, the Anti-Wiretapping Law, and the Cybercrime Prevention Act. Section 1 of Republic Act No. 4200 or the Anti-Wiretapping Law reads: "It shall be unlawful for any person, not being authorized by all the parties to any private communication or spoken word, to tap any wire or cable, or by using any other device or arrangement, to secretly overhear, intercept, or record such communication or spoken word by using a device commonly known as a dictaphone or dictagraph or dictaphone or walkie-talkie or tape recorder, or however otherwise described." "Labag po sa batas ang pinagagawa sa inyo ni Mr Ramon Tulfo. Napakasama at hindi po makatao (What Mr Ramon Tulfo is asking you to do is against the law. This is bad and inhuman. )," Herbosa said. 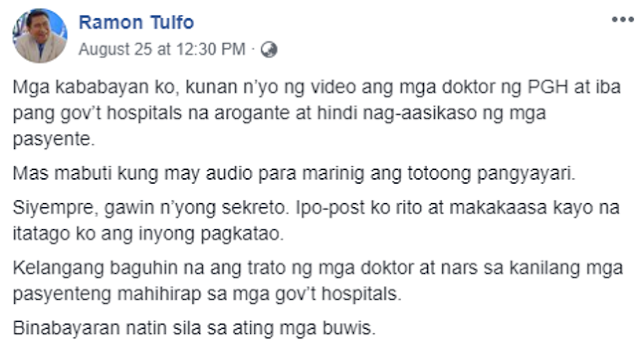 PGH also said Tulfo's "PGH Experience" video violated the patient's right to privacy under the Data Privacy Act and the Code of Ethics of Media Practitioners, as the face of the victim was displayed publicly without consent. The same thing would happen should Tulfo's followers secretly record government doctors' activities in hospitals. "At bawal din po ilagay ang video sa Facebook kasi po ay labag naman ito sa Anti-Cybercrime Law ng Pilipinas. Huwag din po kayong makipag-away sa doktor o nurse lalo na sa emergency room," Herbosa said in a Facebook post. The doctor said should the public have any complaints against a doctor, nurse, or health officer working in government, they should write a letter to the director of the hospital involved or call Malacañang's 8888 citizen complaint center. He also urged Filipinos not to vote for Tulfo should he run for senator in 2019.